'TouchSmart' tech and a new iPhone printing app, natch! 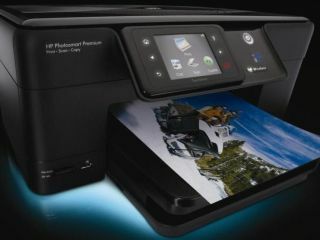 HP has launched a new range in its Photosmart printers line, featuring improved wireless support for Apple iPhone and iPod touch users and HP's own 'TouchSmart' technology. The HP Photosmart C4680 is billed as the ideal solution for home-based scanning, copying and printing, letting you quickly and easily view your photos and documents for printing on the machine's colour display. "The HP TouchSmart frame includes a 3.7cm colour display screen with touch buttons on the left and right sides of the screen for easy navigation through the printing process," reads HP's TouchSmart press release. The HP Photosmart C4680 is joined by other new printers in the range – specifically, the HP Photosmart, the HP Photosmart with Wireless, the HP Photosmart Plus and the HP Photosmart Premium. HP claims that "the new Photosmart series has transformed the printer from a functional device to a fun and creative platform that the whole family can engage with." The company clearly hope that its "unique TouchSmart technology" means that both the oldest technophobe in the family through to the youngest family members "can print photos or games on their own without using a desktop PC" as well as "creative and fun projects using shortcut keys such as the QuickForm button on the TouchSmart screen." Key features on HP's new printer range include the HP Photo Print Gadget, which lets you drag and drop photos to a desktop icon from virtually anywhere and then intelligently edits and crops photos to suit the photo paper size. The HP Smart Web Printing app also helps you to save ink and paper, has built-in wireless features and Apple iPhone or iPod touch support via the free HP iPrint Photo app. The new HP printers will retail from £79.99, for the HP Photosmart C4680, through to £199.99 for HP Photosmart Premium available from October. For more details on the new HP iPhone app head over to www.hp.com/go/iPrintphoto.